The leading mobile phone distributor in the U.S, Samsung have announced the availability of the fashionable and functional flip phone, Samsung Gloss SCH-u440. The new compact flip phone features a full-QWERTY keyboard that is revealed when it is opened and stereo Bluetooth for easy hands-free communication. Music listeners can skip through tracks in the Gloss music player and listen to music by using stereo Bluetooth technology. In addition, the Samsung SCH-u440 has support for U.S. Cellular’s EasyEdge wireless data application service. EasyEdge services gives users easily access to voice-guided turn-by-turn directions, news and weather applications, games and other. Furthermore, the 2.2-inch TFT internal screen which feature CIF resolution with 352 x 288 pixels display. 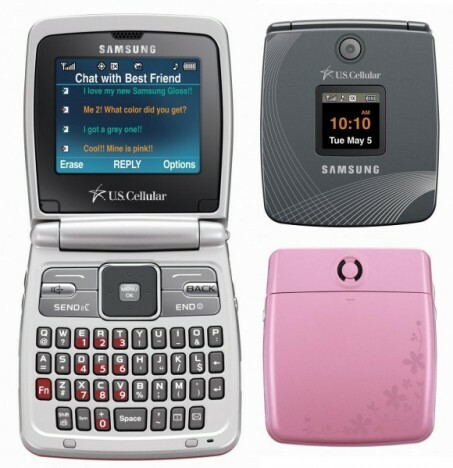 The new Samsung SCH-u440 is available in two colors: Pink and Charcoal. The phone measures just 2.55 x 2.94 x 0.82 inch. Samsung SCH-u440 currently available at U.S. Cellular retail locations or through UScellular website but the price has yet to be announced.